First of all, what is the Expanded Disney Cartoon Universe? The dream started in the very first episode of the new DuckTales cartoon, where they name-dropped the cities of St. Canard, Spoonerville and Cape Suzette. These are otherwise known as the cities from Darkwing Duck, Goof Troop and TaleSpin, three other super-popular Disney after school cartoons from my youth. In that moment, a vast world of awesomeness opened before me. Back in the 90s, none of these cartoons were connected, despite all being about Disney characters living normal lives. Launchpad McQuack and Gizmoduck were the only characters that crossed over from DuckTales to Darkwing Dark, but it was barely remarked upon. I don’t think anybody ever knew why Launchpad no longer worked for Scrooge McDuck. All these Disney cartoons never really had anything to do with each other. But with this new show, I thought for sure that the writers had a plan. Why name-drop those cities if you weren’t planning to do something with them? Just to be cute? Why not do something with them? It’s your show. They’re all owned by Disney. Why not make a big, interconnected cartoon landscape? It’s worked gang-busters for the Marvel Cinematic Universe and the DC superhero shows on The CW. Think of the connections! Huey, Dewey, Louie and Webby hanging out with Gosalyn! A complete backstory between Donald Duck and Goofy that now involves Goofy bringing his son Max to come visit! An epic airplane adventure with Launchpad and Baloo the Bear! The possibilities are endless! But no. They are not to be. The dream is dead. 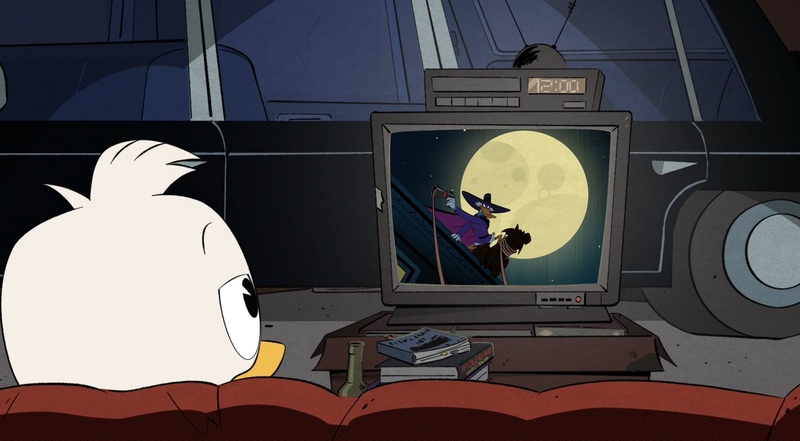 Dewey is watching an episode of the old Darkwing Duck TV show. 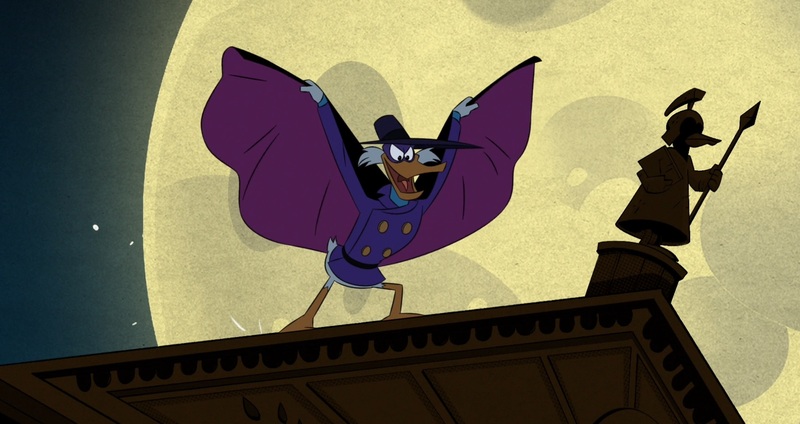 Darkwing is apparently the DuckTales equivalent of the old 60s Batman show, starring actor Jim Starling. That’s what they’ve done with Darkwing Duck. All he’s used for is to have Launchpad, a fan of the show, giving Dewey a lesson in old school heroics. Launchpad even has a Darkwing bobble head on the dashboard of his car, using the phrase, “Let’s get dangerous” to spur him into taking risks. They turned him into an off-hand gag about old TV shows. 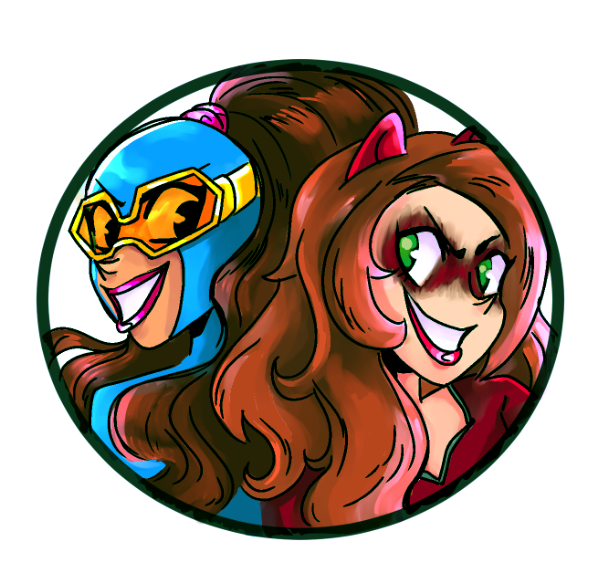 Why not do a proper crossover? This is DuckTales! The show’s universe already includes things like Greek gods, Atlantis and ancient curses. Why not have a gothic superhero fighting crazy criminals in St. Canard? Why not make Darkwing and his family reoccurring characters who pop in every once and awhile? Why not establish some real continuity for Launchpad between the two worlds? Why not do something fun?! I’m a pretty heart-broken nerd over here. I was already having doubts about the quality of the DuckTales cartoon, and this cements my growing disinterest. It’s an OK show, but it’s not very meaty. They seem perfectly content to coast along with their content. And I didn’t care for the Gizmoduck introduction. So eh. It’s not a big deal in the grand scheme of things. But I had hopes and dreams, everybody! And those have been cruelly dashed. Posted on May 17, 2018, in Cartoons, Television and tagged Darkwing Duck, Disney, Ducktales, Goof Troop, TaleSpin. Bookmark the permalink. 1 Comment.